MAD RIVER – The Hammond Bridge is disintegrating and, at the current rate of corrosion, will be unsafe in 10 years, give or take. 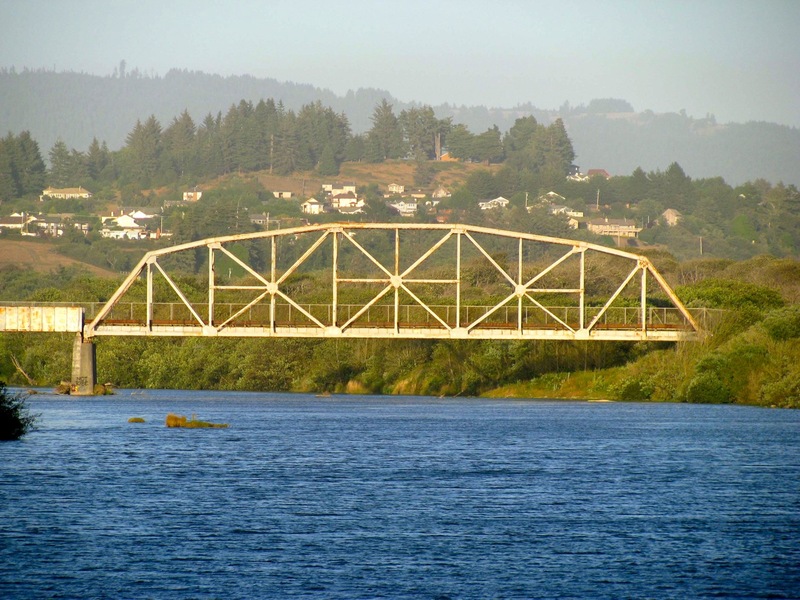 With this in mind, Humboldt County Public Works has launched a study looking at alternatives for replacing the pedestrian bridge, which spans the Mad River and connects McKinleyville to the Arcata Bottom. The bridge would most likely be replaced with a cement structure – a utilitarian bridge designed to withstand the elements, but lacking the interesting geometric shapes and vintage charm of the existing trestle. Humboldt County Public Works Deputy Director Chris Whitworth talked about the bridge and the need to replace it at last week’s meeting of the McKinleyville Municipal Advisory Committee (McKMAC). Whitworth was in attendance to update the committee on various Public Works projects in the McKinleyville area. The bridge has been perched above the Mad River estuary for seven decades, under constant assault from the salty ocean air. The corrosion is eating away at the structure day by day. At the current rate of rust, the bridge will be unsafe in about a decade, Whitworth said. Back in 1997, the county looked at painting and repairing the bridge. It was determined at the time that the entire structure would have to be sandblasted and re-coated. This would be problematic, because the bridge is covered in lead paint. Winzler & Kelly Consulting Engineers conducted a study, in which it power washed a small portion of the bridge, collected the wash water and analyzed it. The consultants found that the wash water contained concentrations of lead and zinc that were well beyond what would be allowed to be discharged into the Mad River estuary. In order to paint the bridge, the entire structure would have to be wrapped in a giant diaper, with all of the lead paint carefully collected and then shipped to a hazardous waste disposal site. This would be prohibitively expensive and would be a temporary fix, as the bridge would need to be repeatedly repainted in the years to come. In an interview, Whitworth summed up the problem. “It’s steel in close proximity to the ocean,” he said. A steel structure near the ocean needs constant maintenance, he said, noting that the Golden Gate Bridge has a never-ending painting and maintenance program. Public Works will look at several alternative bridge designs in its study. The most likely design is some sort of concrete box girder bridge, similar to the 17th Street pedestrian overcrossing in Arcata. A cement bridge would cost about $3.5 million to construct. A more attractive arch bridge, which could share some of the aesthetic appeal of the existing bridge, would cost about $7 million, nearly twice as much as the concrete structure. Whitworth said that Public Works will complete its study and pick a preferred alternative sometime this spring. When it does so, the department will seek public input. Then the department will make a final decision on the alternative, and then have a final design completed for the new bridge. After that comes the hard part – finding a few million dollars to pay for the project. At the Dec. 19 meeting of the McKMAC, McKinleyville resident Mark Rynearson suggested that rather than replacing the bridge, Public Works should extend the Hammond Trail east along the Mad River and connect to the new U.S. Highway 101 Mad River Bridges. The new northbound bridge includes a dedicated pathway for pedestrians and bicyclists. It’s separated from the traffic and should open in the coming year. But in order to extend the trail, Public Works would need to purchase property from three different landowners who hold property between the Hammond Bridge and U.S. Highway 101. Rynearson said that with enough money, the landowners would likely be persuaded to sell a right-of-way for a trail. Given that the bridge project would cost at least $3.5 million, this could be a less expensive alternative, Rynearson noted. In a later interview, Whitworth said that as a government agency, the county can only acquire property based on its assessed market value. It can’t pay more for property than what it’s worth. Whitworth said the county is pursuing a bridge replacement to maintain the current Hammond Trail system. The steel trestle portion of the bridge was transported from Washington in 1941 and reassembled over the Mad River. It was used by the Hammond Lumber Co. to haul lumber via train from Crannell to Humboldt Bay until the 1950s. Sometime later, the tracks were removed, as well as the ramps leading up to the trestle. In the 1970s, the now-defunct Humboldt Bay Wastewater Authority (HBWA) acquired the railroad right-of-way, including the bridge. The agency was going to create a regional wastewater disposal system, which never materialized. The HBWA later disbanded and the bridge ended up being the responsibility of the McKinleyville Community Services District, according to a report prepared by Public Works in 1997. In 1982, the County of Humboldt and the MCSD signed an agreement to co-own the bridge. This coincided with the start of construction of the Hammond Trail, which was developed in sections over a period of three decades. In 1982, the trestle was perched above the Mad River but didn’t include ramps on either side. These were built and the bridge became a pedestrian and bicycle connection between McKinleyville and the Arcata Bottom. The MCSD also installed a pipeline on the bridge so it could pump treated wastewater to ranches in the Arcata Bottom. The wastewater would be used for irrigation, and solve the district’s problem of how to dispose of the effluent during the summer months, when it’s not allowed to dump the water in the Mad River. The MCSD now disposes of its wastewater at its Fischer Ranch at the corner of School and Fischer roads during the summer. The MCSD Board of Directors has yet to discuss what role, if any, it would play in the replacement of the bridge. This entry was posted on Sunday, December 30th, 2012 at 11:51 am	and is filed under News. You can follow any responses to this entry through the RSS 2.0 feed.